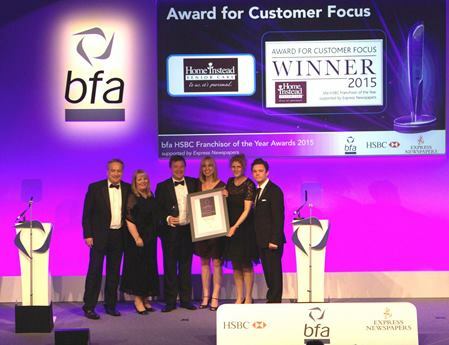 We are delighted to announce that we picked up the top award for Customer Focus at the bfa national awards, held on 25 June at the ICC, Birmingham. Home Instead is very much a people centred business and our focus is all about caring for others, delivering only the very best customer service. The Customer Focus award acknowledges companies that have demonstrated a clear focus on customer service, and can illustrate that its approach to customer care and relationships underpins everything they do. We have developed a number of market leading initiatives where we measure satisfaction for both CAREGivers and our clients which we believe is unique in the care sector. We conduct regular surveys including PEAQ (Pursuing excellence through the advancement of quality) which gathers feedback from our clients about the quality of service they receive and from our CAREGivers about their levels of job satisfaction and engagement. We also carry out satisfaction surveys and a mystery shop programme. Home Instead Senior Care which specialises in providing non-medical care for older people helping them to continue living in their own homes has set the gold standard in the home care sector, where its quality service has seen it pick up numerous care and business industry awards.